I use balsa wood carved to the shape of a conifer trunk, then score the trunk liberally with my razor saw to simulate bark. After this step I will then stain and color them. I will raid the neighborhood juniper bushes (with permission of course), for the appropriate branches for the scale I am working in, (On30). Where I work, there are juniper bushes all over the place, and the company owners don't care. I told the GM recently, that if the juniper bushes start looking a little barren, he will know why. 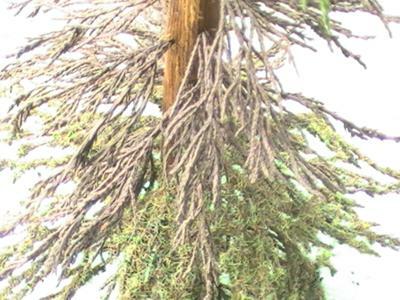 I will soak the juniper in corn huskers lotion for about 12 hours, then rinse them and lay them out on paper towels to dry. This will keep them from becoming brittle. 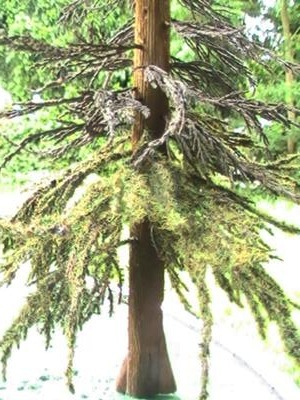 I then spray paint each juniper branch with brown and gray paint, letting just a touch of the original color show through. I will spray each branch with super 77 spray adhesive, sprinkling static grass of different shades of green on each branch. I will then drill holes that are staggered all the way up the trunk of the future tree. 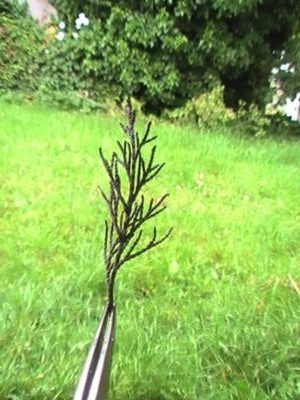 Once all has dried, I will begin to glue each branch in its appropriate place. Starting with longer at the bottom and ending up with shorter at the top. Sometimes I will put longer ones up higher. 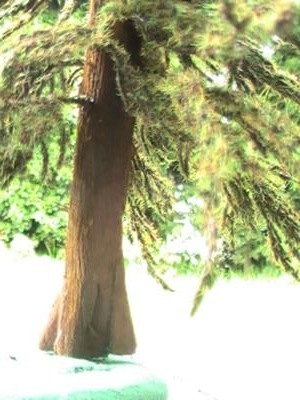 These make gorgeous fir trees. I have been told they look like real trees on more than one occasion. Some have said, "that is too much work." Well, we spend good money on craftsman structure kits and then when it comes to our trees, we skimp in my opinion. Granted, on a large layout, it would be very difficult to do this. But, on a module, it is all or nothing. Each tree on my modular layout is handmade with the same care I build the structures. Trees deserve love too!